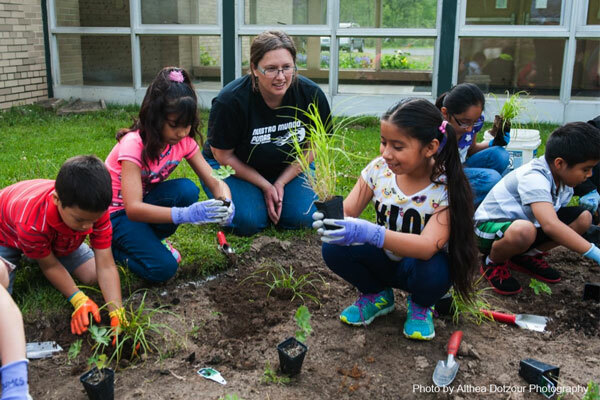 Through MAMGA Community Services Grants to schools, public or non-profit community gardens. If you are interested in applying for a MAMGA Community Garden Grant, please complete and submit the form below. Click the bar to download the application in either format. Applications must be submitted between November 1, 2018, and April 13, 2019. Past projects are listed below. The grant supported the installation of 3 additional raised beds to grow vegetables, herbs, berries, and asparagus. Produce was available to WI Hts gardeners or local food pantries. Gardeners donated a minimum of 6 hours to work on the project. Five organic straw bale garden areas were added to demonstrate the methods and to control weeds that are invading existing garden areas. Various types of gardens, (pizza, salsa, squash and gourd, etc) were implemented. The grant supported relocating the garden to a sunnier spot and building raised garden beds for each age group, 4K to 5th grades and special needs students. Students learned about growing their own food from start to finish and the healing value of a garden area for those who struggle with physical or mental health issues. Gardens is also be used by art classes. The grant paid for the purchase of vegetable gardening tools and a rain barrel. he grant is for the purchase of worms and composter equipment and supplies (tea bubbler and moter, activator, etc) and to demonstrate this form of organic composting to 270 students in the school gardens. Compost materials are gathered by students in the cafeteria. The grant supported the expansion of growing vegetables in containers and installed a water collection system including a rain barrel.